Ideal for laboratories, research institutes, schools, etc. 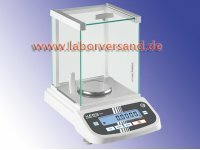 for convenient access to the weighing material. Large backlit LCD display with 16 mm digit height. RS-232 interface for printers or data transfer to PC.